1. 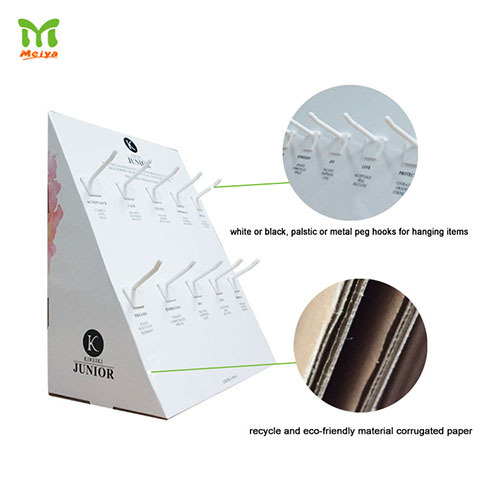 Included Removable peg hooks,10 pcs. 2. Used in retail pos and limited space. 3. Customized color, size, mounting styles, additional process. All corrugated display can be supplied on request. Point of purchase-POP displays are created with eye-catching advertising for products promotion or impulse buys. There are 10 removable pegs and easy to set up for the user. The procduts can be presenting with additional informations clearly and charming so that entice the people to buy. Wide range of applications: Cosmetic products, Micro USB charger cables, candy, chocolate etc.